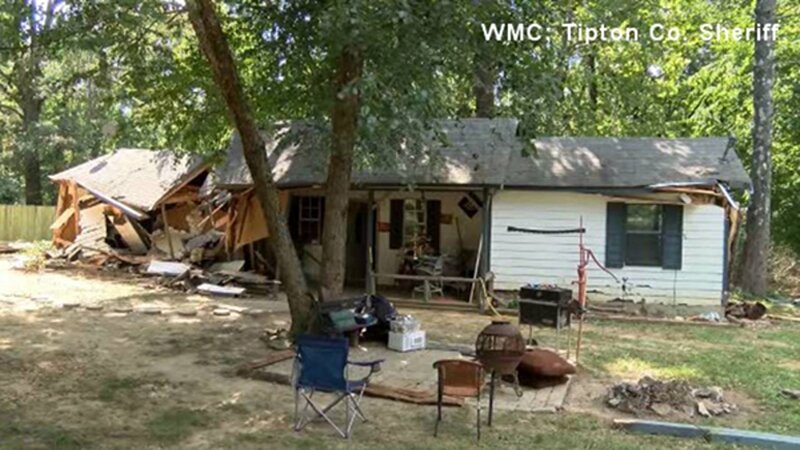 DRUMMONDS, TN -- Authorities say a dispute led a man in Tennessee to drive a bulldozer through his neighbor's home, WMC-TV reports. It all started with reports of gunshots on Friday. John Higdon told authorities he started shooting at several people in camouflage suits running around and hiding in the woods behind his home. After deputies arrived, they searched the area but didn't find anyone. Higdon was arrested for reckless endangerment. Authorities say while he was in jail, his neighbor, Edgar McClellan, knocked down his house with a backhoe. John Higdon's brother, Sammy, is outraged. "This man over here decides to come over here at two o'clock in the morning, comes over here at two o'clock in the morning with a dozer, a tractor, and starts pushing the house down," Sammy Higdon said. "I ain't ever seen nobody who can go and push someone's house down. I just want, I want answers, and I want him to pay for the damages, what he done." McClellan has been charged with trespassing and felony vandalism. Both McClellan and John Higdon are out on bond and awaiting their court dates. More charges could be filed.